Who would win.I think Colossus. Colossus because his strength was up to regular hulk strength. The thing was no way near to regular hulk strength . Wrong.Colossus and the Thing are both on the same strength level. "Strength: They're both each others equal in the strength department. Armor: Thing has a rock-like body and Colussus a body made from organic steel, both can take quite a pounding.. no clear winner either. Fightingskill: The Thing has been fighting all of his life, in contrary to colussus. So thing has more experience. Colussus however has been trained by the best of the X-men in the dangerroom. So he would definitely know how to handle himself in combat. So in my opinion it would be a pretty close fight if we look at the powers and skills both have. However i think Thing will be victorious. The reason for this is because Thing just has a bigger thrive to win. Colussus is basically a nice guy who doesn't really want to fight, but will fight if he has to. While Thing will do everything he can to win and simply won't give up, even if it means he'll have to fight a bit dirty to win. So my vote goes to Thing!" 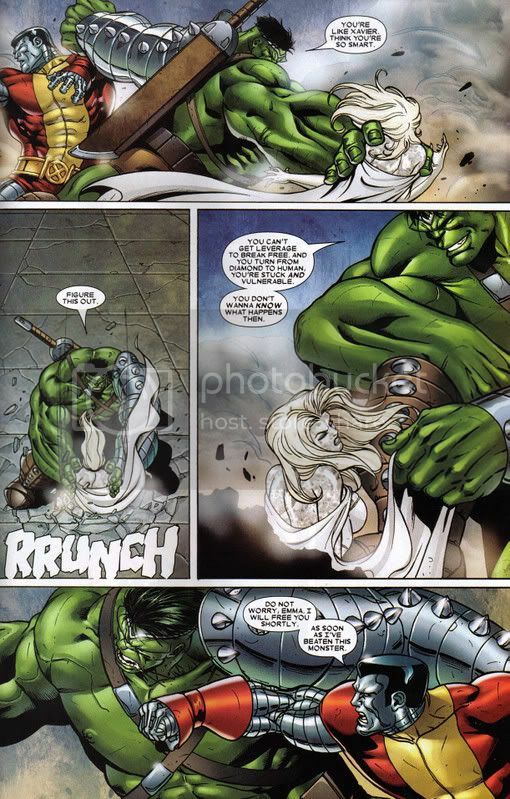 No read this they are remember thing always loses to the hulk but watch collossus fight wwh and see what wwh says And read this And thing was NEVER a decent oppenent for HULK"
Actually the Thing Beat hulk after suffering further mutation and going crazy(something like that). The scan isn't showing anything but an opinion, Colossus got into submission immediately. Colossus has much better armor. "Steel beats rock. Colossus has **much** better armor. Brainiac 1.0, that scan proves less than nothing within the basis of this thread. Now, if this were a Colossus vs. WWH thread maybe..."
Actually the Thing skin isn't rock, it is just rock like. You can't just discard it by that principle. And WWH would beat Colossus easily. "Actually the Thing skin isn't rock, it is just rock like. You can't just discard it by that principle. And WWH would beat Colossus easily. zzzzzzzzz"
Well, how about this, we know that Wolverine once (adamantium) clawed Thing's face forcing him to wear a mask for a few months. On that basis, Colossus' armor is better. Well, how about this, we know that Wolverine once (adamantium) clawed Thing's face forcing him to wear a mask for a few months. We also know that Wolvies claws generally can't penetrate Colossus' skin. (i'm unsure how often and how hard he's tried) On that basis, Colossus' armor is better. " That basis is variable because Wolverine has never actually tried to pierce Colossus. This was discussed in another forum no long ago. You can't say Colossus won't fight a little dirty to win. He killed Psylocke and David in Ulimate X-Men by crushing them under a car because he felt it was the only way to take care of the problem. "Let's say if Superman were wearing adimantium claws... it will penetrate colossus skin. Adamantium is unbreakable... Colossus' organic steel skin is. " Nearly unbreakable. There have quite a few instances in comics that prove that adamantium is quite breakable. "That basis is variable because Wolverine has never actually tried to pierce Colossus. This was discussed in another forum no long ago.zzzzzzzzzz"
Regardless, we're getting off topic. The fact of the matter is that when the creator of these characters made them, they based their armor off fairly common real-life substances. Stone in the case of the Thing, and Steel in the case Colossus. Neither character's skin is actually made out of the substance, its made out a substance of similar strength and such, but it has to be flexible. Given that, I think Colossus has the better protection. @Satyrquaze: I vote Colossus because of steel vs rock also. But in comics I have not seen anything to support that Colossus is more durable. Colossus is class 100 thing is class 75/80 tons & colossus can take alot more punishment then thing could ever dream of but thing never quits no matter what but i'd say colossus wins more times then thing .
" adamantium used to be breakable but nowadays its unbreakable "
There are 4-5 types of Adamantium. Some brittle than others, some that are virtually unbreakable unless with molecular powers like Magneto warps it. Those are all old comics. @ComicStooge: yes, what is the problem? 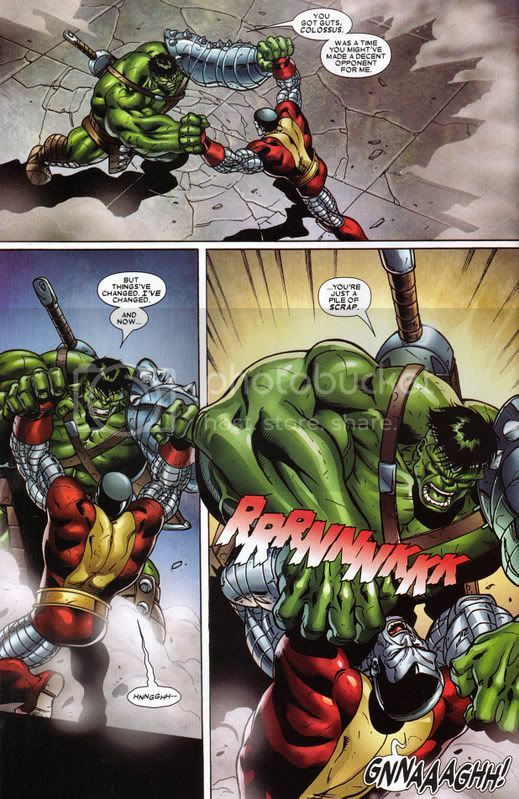 The world war hulk bit isn't good he got one shotted straight after & was ko'd as colossus lasted longer then thing against world war hulk & that comic colossus vs hulk on that hiking trip colossus held his ground & out fought out smarted hulk . . There are 4-5 types of Adamantium. Some brittle than others, some that are virtually unbreakable unless with molecular powers like Magneto warps it. " True Caps shield is the strongest form followed by WOLVERINE'S BRAND. The rest are a joke. H2H: they're relatively equal, Colossus getting Danger Room Training & obviously time with Logan. Ben Grimm was a Boxer & all-around grappler (Wrestling, Judo, etc) for years before transforming. They both fight constantly dealing with enemies so they probably have effectively equal real-world H2H experience. What it's really going to come down to is Heart. Sorry X-fanboys but the Yancy Streeter's got this fight cinched, Colossus just ain't figured it out yet. Colossus will win here. I think Colossus is more invulnerable and more durable than Thing. I also think Colossus is stronger. I dunno. This is always a hard one to call for me. I'd have to go with the Thing, though. He's done better against Gladiator than Colossus and in X-men annual #5 Thing beat Colossus in an arm wrestling match. I know that doesn't say much, but it's something. Then again Colossus did way better against Vision than Thing did but I think Colossus beating Vision was PIS. I feel this one would be taken by Colossus. Sure thing has experience, but that only goes so far. I think Colossus is stronger and more durable. An organic steel-like body beats a rocky-like body any day, But this would be a nice fight to see in a comic...why hasnt this happened? Tough one. Im going to say thing because hes got a tougher attitude and would want the win more.